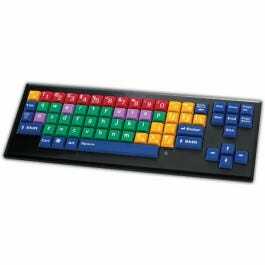 Color-coded keyboard features large 1" keys and lowercase letters. Children as young as three years old are becoming skilled at using the computer keyboard, but the use of upper case letters can be confusing for those who have not mastered the relationship between capital and lower-case letters. This USB keyboard has large, bold, easy-to-read lower-case lettering, big 1" keys, color-coding for vowels, consonants, numbers and function keys, and responds to gentle finger pressure. 19" x 7" x 1.5". Compatible with Windows and Mac OS.